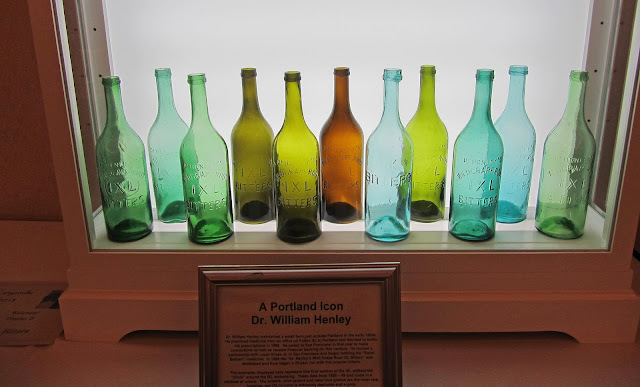 Sorry about the hiatus from bottle articles. I've been entangled in a "consulting job from hell" since Canyonville. Nothing like small town politics coupled with a government employee with a big title, an equally big ego, combined with a bad attitude to make life "interesting". Anyway, the project is done... And, I was long overdue for a reversal of fortune! No, not the bouncing baby kind. Decades ago, I met an old guy named Howard Height. He owned the property where the old Ashland dump was located. It wasn't the earliest dump in town, but it had good age; late 80's / early 90's through early post turn of the century. It was huge! Howard dug, and dug, and dug. He also was magnanimous enough to let others dig; if you paid him a digging fee. And, he got to keep his pick of what came out of the ground. Howard set up his own little "museum" and would occasionally sell stuff if someone offered him enough. Most of the time what Howard thought was enough, was over the top, and so I never did consummate any purchases. Still a visit to the museum was always a welcome diversion. I recall one time, around 1976, when Howard showed me a killer whiskey that he'd just dug. Not for Sale! ; he said. Being a whiskey guy, even then, I was duly impressed. Whiskies were a rarity in the pious pre 1900 town of Ashland. Good grief, the churches outnumbered the saloons by something like 5 - 1. But on rare occasions, Ashland did yield up some power. I recall digging a tri color enameled Blumauer and Hoch - Old Kentucky Home Club / OPS shot glass around that same time. 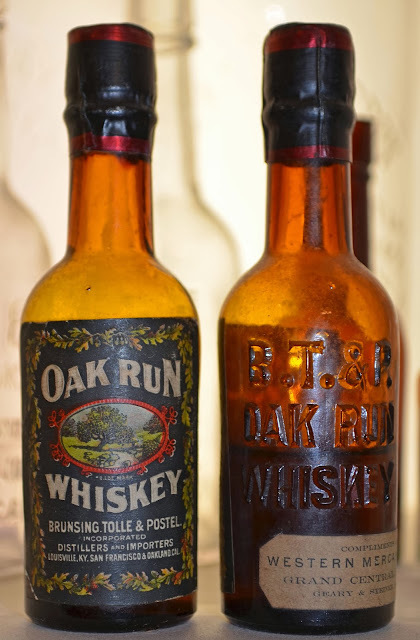 Of course, that was down in the old railroad district, where you'd expect to find whiskey. 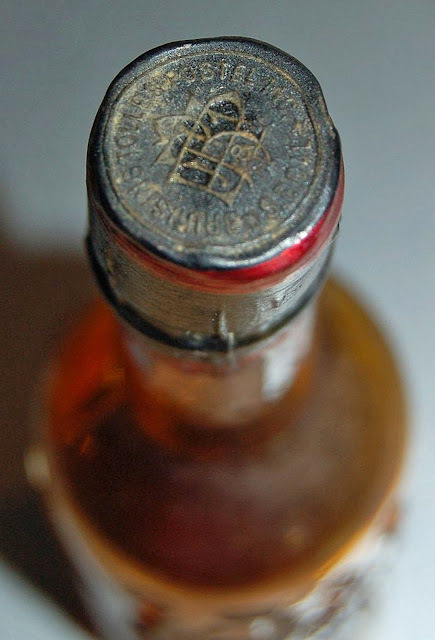 The whiskey that Howard found was a mini, a sample, embossed BT&P Oak Run Whiskey. I'd never seen one, and knew nothing about it. Still, it was intriguing. First thing I did when I got back to our place was to bust out Wilsons "Spirits Bottle of the Old West". That was "the bible" back then. Sure enough, right there on page 39, was a description and on page 37, a picture of the bottle. I had the amber fifth Brunsing Tolle and Postel in my collection, and boy that mini would fit in nice. But no, that bottle was destined to be one of Howards "keepers". In the 90's, Howard sold the property. It was bulldozed, graded and condominiums rose on the site. No more Ashland dump, no more Howards museum. I don't know what ever happened to that bottle. But, I've wanted one ever since I first laid eyes on it. A couple of weeks ago, I got a lead about a person that had some minis. It's been a bit of dry spell in regards to bottles here. As such, I wasn't overly excited. Still, the lead you ignore is normally the one that turns out to be the "one that got away". This was one that didn't get away. I touched base with the owner, and the response that I got was mind boggling. Here was my long lost Oak Run mini. But not just any old mini, this one was complete with labels and contents as well. 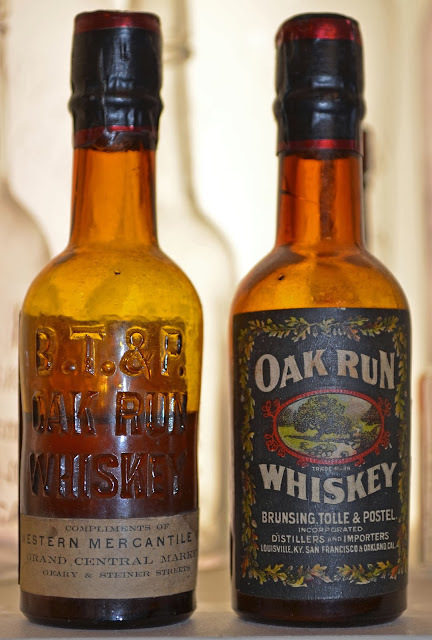 Brunsing Tolle and Postel "Oak Run" twins, to be precise. An Oak Run Home Run! The move from the middle of the month, to the first weekend in October seems to have been a blessing in disguise. For whatever reason, the seasons have changed. This year saw the wettest September ever recorded in Oregon. The fall colors appeared weeks early, trees are already dropping their leaves and it is now freezing at night. However, the weather for show weekend couldn't have been better. 70's during the day, crisp and cool at night. Crystal clear afternoons and best of all, no rain! The perfect weather no doubt helped attendance. Early attendance was up again this year and Saturday saw a steady stream of local people through the doors. 75 sales tables and eight displays filled out the show. 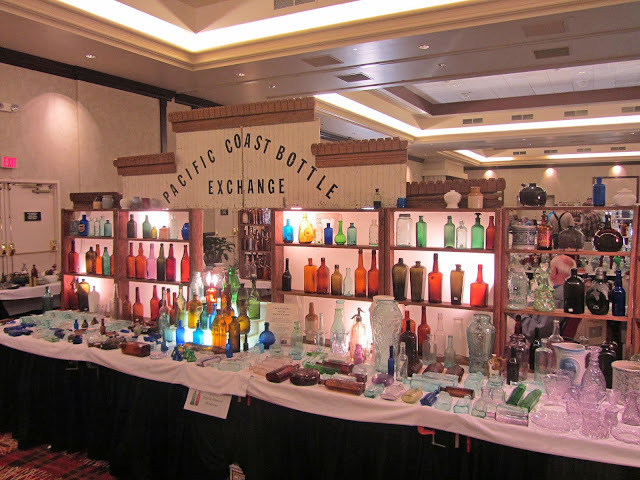 Several collections, fresh to the market, were on the tables and a number of new faces appeared behind dealer tables. 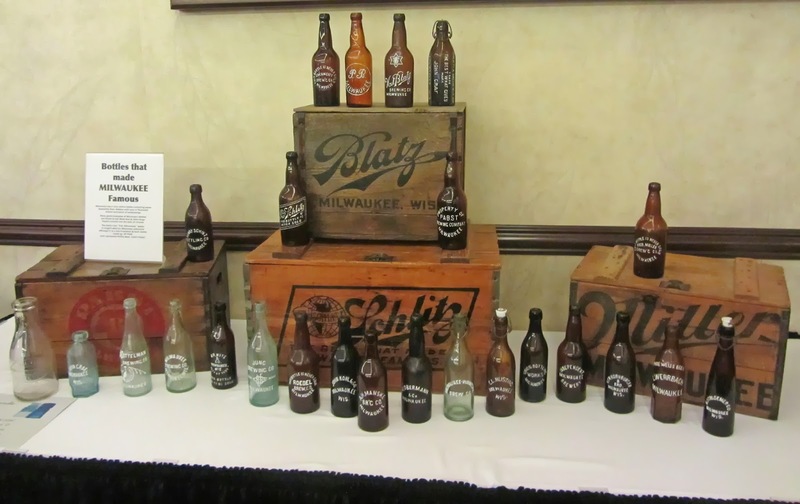 Many of the dealers that we spoke with reported strong sales in the four figure range. 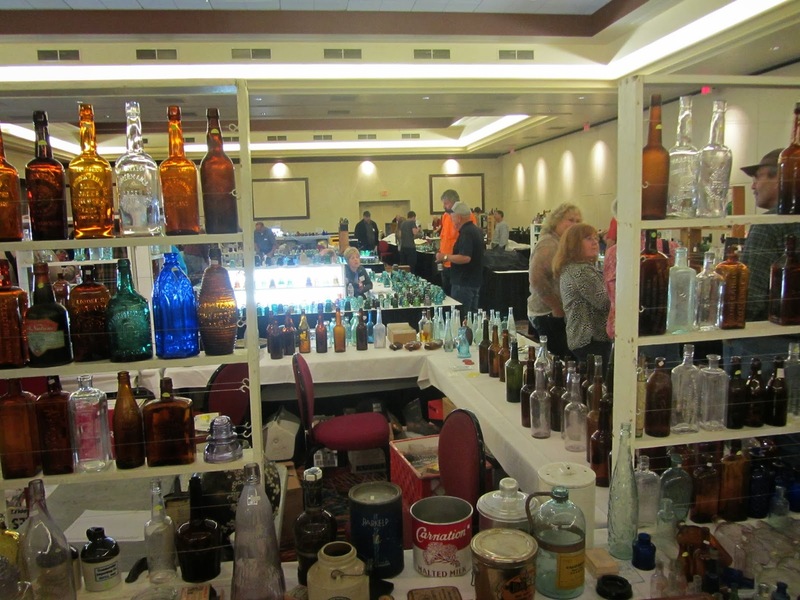 The Saturday auction table continued to be a hot spot. Dealers were presented with a free raffle drawing for a crisp $100~ bill. Seven Feathers again donated a meal and lodging package, which rounded out the free dealer drawings. Eight displays were set up, representing both the bottle and insulator hobby's. A hot topic in both areas of collecting continues to be the dearth of fakes flooding the market. 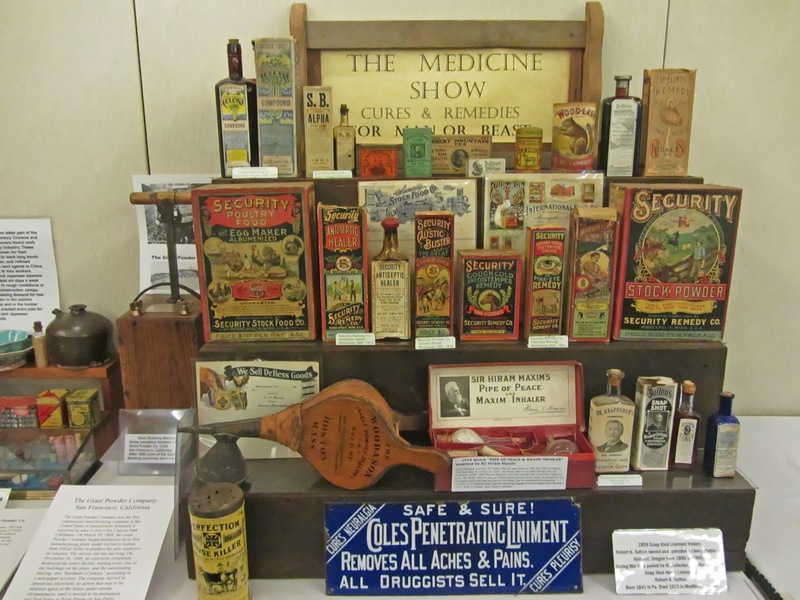 A bottle display, entitled "Real or Repro / Fantasy or Fake" was especially popular and was awarded the Federations Most Educational ribbon by a team of judges representing both hobbies. Raffle prizes this year were over the top. American Bottle Auctions helped out by selling us a group of three historical flasks for a reasonable price, and a killer group of insulators were offered to balance out the raffle table. The third raffle prize was a custom display cabinet with a retail value of $750~, designed to accommodate either bottles or insulators. Unfortunately, in the rush to get to the show, I forgot my camera. Anyone with photos of the show is asked to send them to me so that they can be posted. And so, this years "C'ville Show" is now in the history books. We'd like to thank everyone who made the trip and will look forward to seeing one and all again next year. Same weekend / Same place.